There are dozens of viewpoints, or “Miradouro’s” in Lisbon offering wonderful views. There’s no other like the Miradouro Panoramico de Monsanto though. 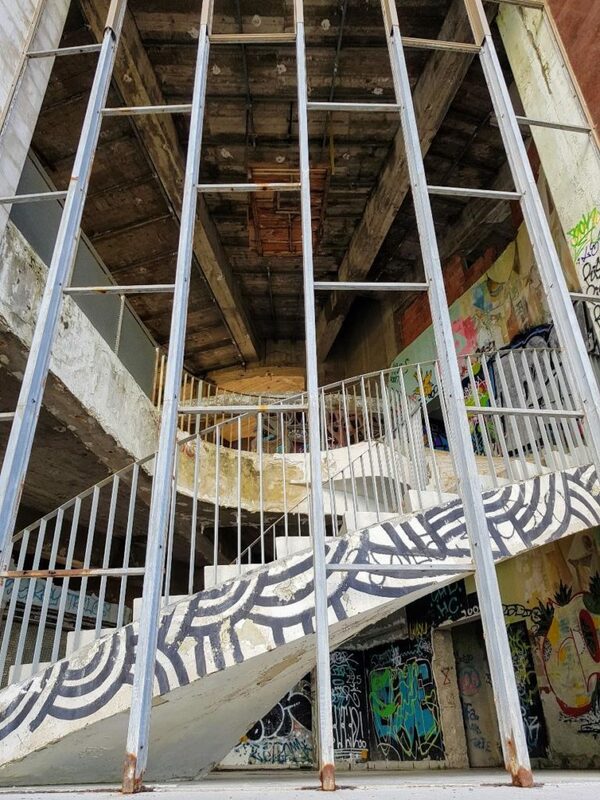 Not only does this have the best view in Lisbon, it’s also one of the most fascinating and exploration worthy buildings. This is a side-trip that’ll show you a different side to Lisbon! The building itself is really quite new – it was only built in 1967. It’s crammed an awful lot into those fifty years though. 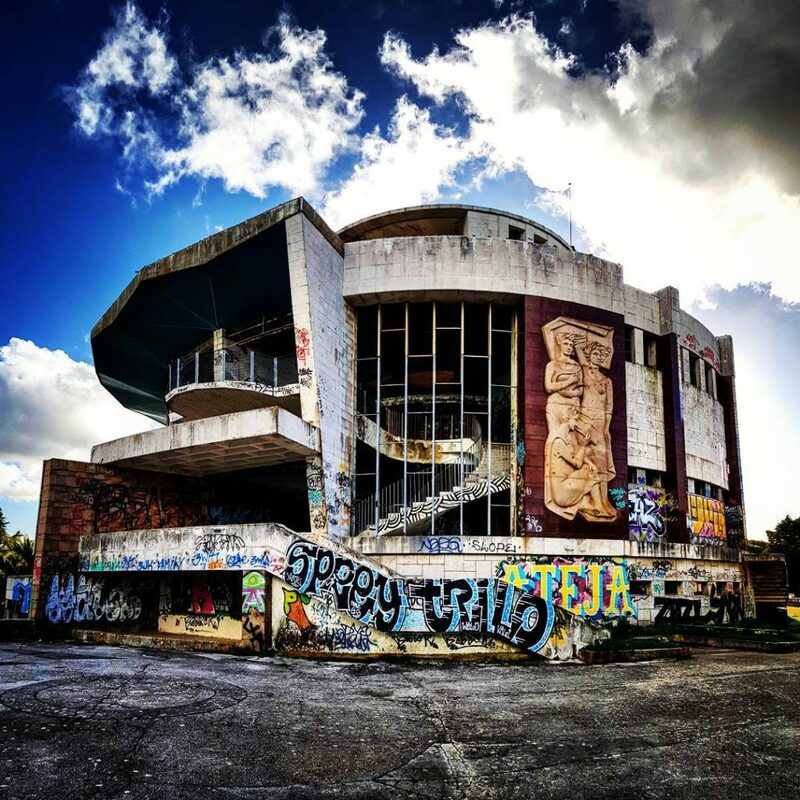 From a high-society meeting place in the 1960’s and 70’s it sadly became a derelict and dangerous eyesore, and finally a cleaned-up yet still gritty tourist attraction today. 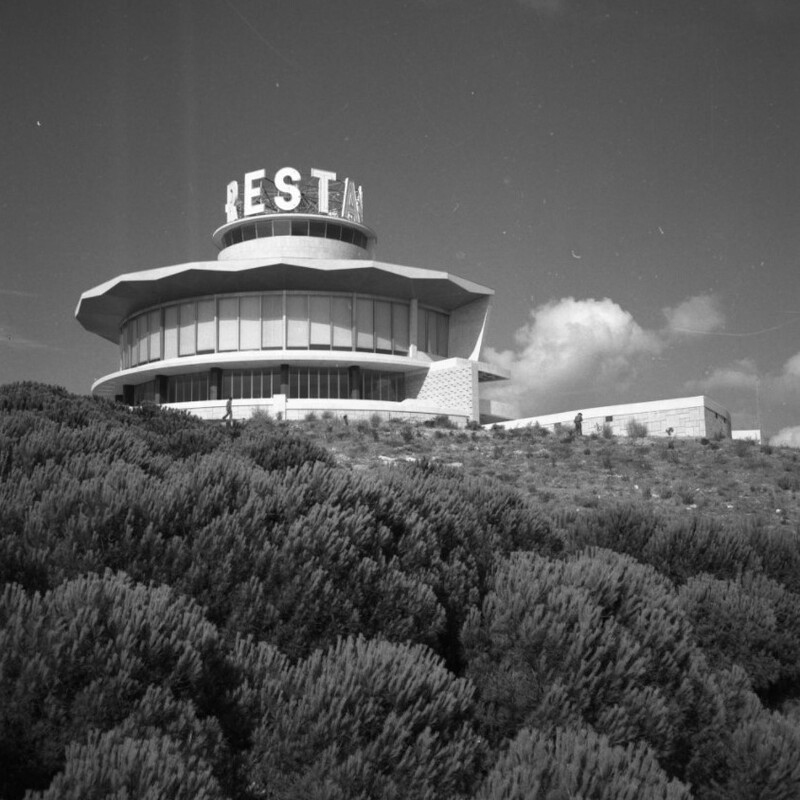 The modernist masterpiece opened in 1967 on one of the highest points in the Monsanto Park above Lisbon. 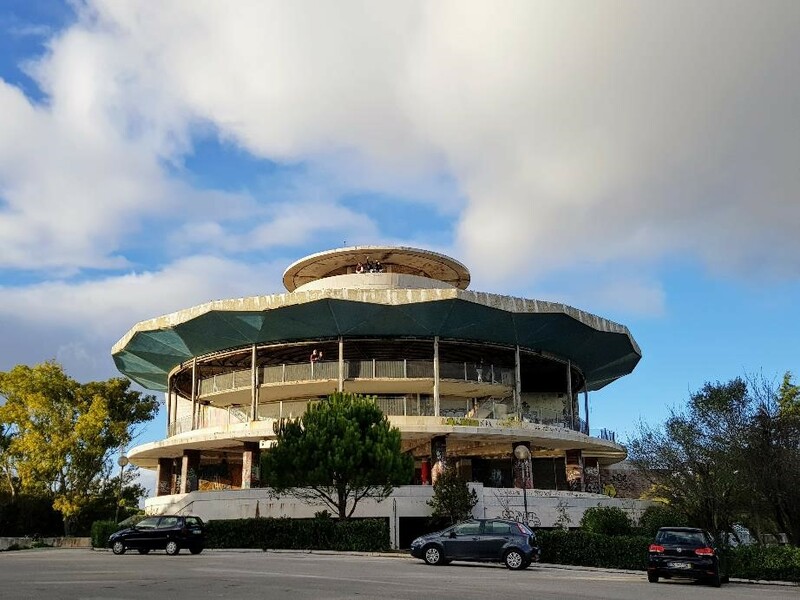 Resembling a UFO, the building housed a restaurant, bar and coffee lounge, as well as the rooftop belvedere. The big selling point was the view – at 205m above Lisbon the whole city lies before you. The restaurant with a huge circular glass wall made the most of what was the best view in Lisbon, and wealthy residents, celebrities and politicians flocked there. I really don’t think I’ve visited anywhere quite like this. 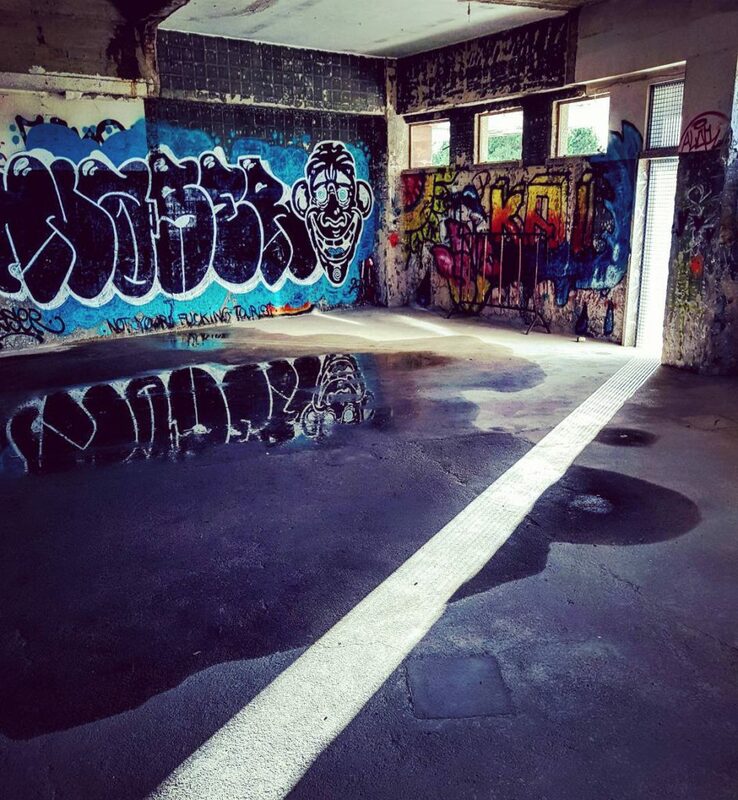 There’s a lingering feeling of menace in the building, with the dark stairwells, dripping concrete and graffiti covered walls. But then you see an official signpost pointing you to the next floor, or newly installed safety railings and smoothed concrete. And around the corner you find instagram groups or a fashion photoshoot, but also up on the roof a group of kids with a guitar eyeing you with suspicion. This is a building still in flux. Amazing building. There’s enough left to imagine what it was like in the 1960’s as a bold statement building. The Panoramico de Monsanto is about as raw as attractions come. In fact it doesn’t even set out to be one. There’s no entry price, no guidebook, and no staff except a lone security guard on the gate. 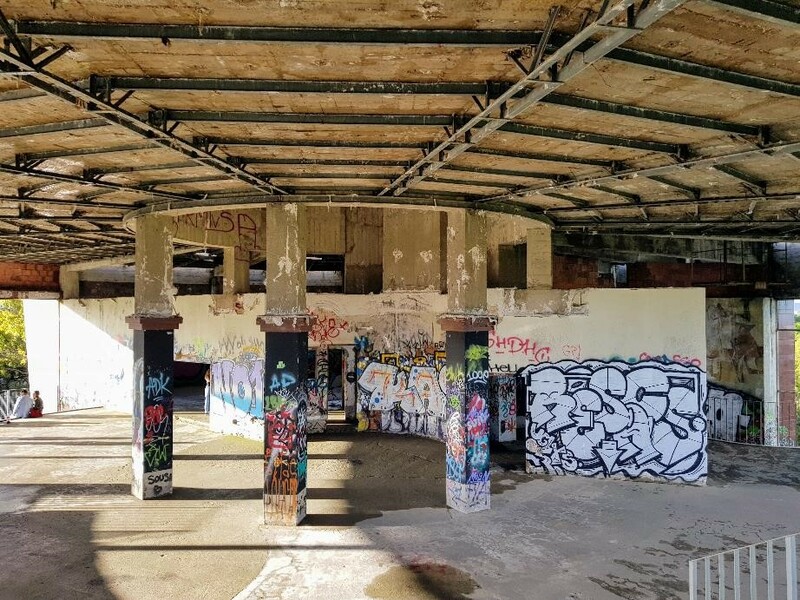 It almost feels like the city worked out people were going there anyway, so probably better to make it safe and useable than have all the problems of a derelict building. You won’t find this in any guidebook, and right now it’s mostly locals who know about it. The first floor above ground is the original bar area – here you’ll find the amazing ceramic panel artwork by Manuela Madureira. 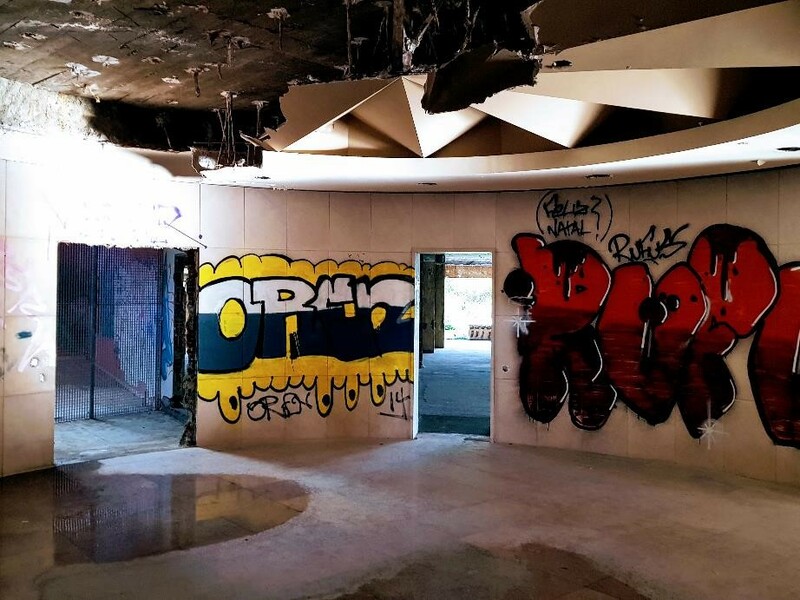 At the rear, the sweeping circular staircase takes you past the remains of a mural by Luis Dourdil. Sadly little remains due to vandalism and weathering. The next floor is the restaurant space – a huge room opening out onto the best view in Lisbon. Going further up you eventually reach after a couple of small rooms the Belvedere itself. This gives an almost 360 degree view of Lisbon, and the whole room is decorated with amazing tile panels displaying the sights in front of you. Be here for the sunset if you can – it’s worth it. At the rear of the Belvedere is a fabulous tile mural of the city before the earthquake. The juxtapositioning of traditional Portuguese crafts such as tilework in such a modernist building makes this a fascinating place. The building has been made safe and all dangerous materials removed, and there are railing where needed. Regardless, it is essentially a derelict structure so just take care. 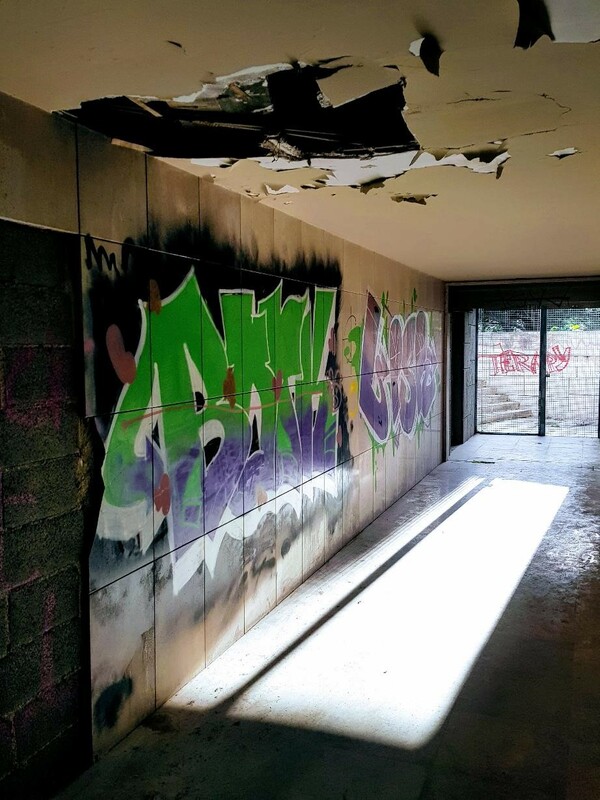 In addition, although the graffiti is now a part of the attraction, please remember how much of the original interior artwork and structure has been lost due to vandalism. Leave it as you found it…. It’s easy to find on Google Maps, but not easy to reach without a car. 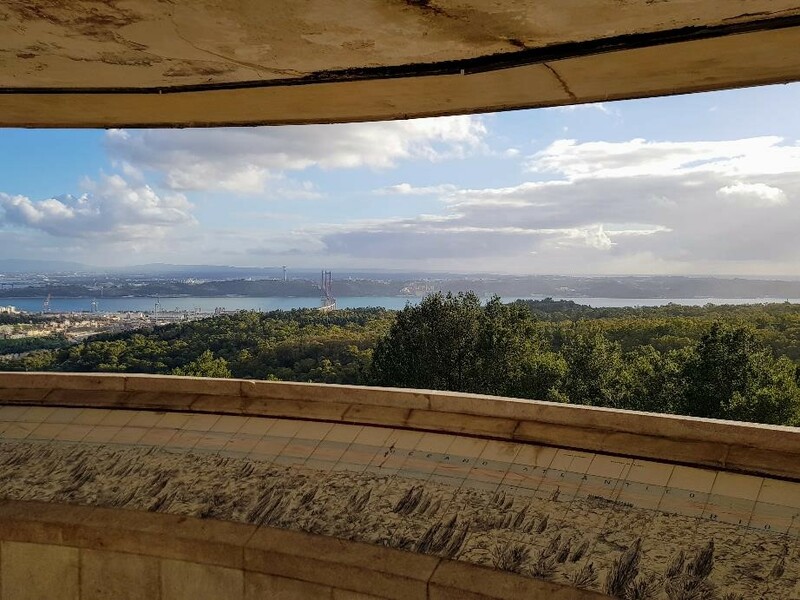 You can get the 711 bus from central Lisbon to a stop at the end of the Estrada da Bela Vista, some 700m away – from here you’re on foot. The site is open in the hours of daylight only from 9AM till sunset, and there is now round the clock security. It might seem like an unnerving place, but it’s now quite safe to visit. You won’t find it on any tourist websites, and it probably isn’t on any of the organised tour routes. 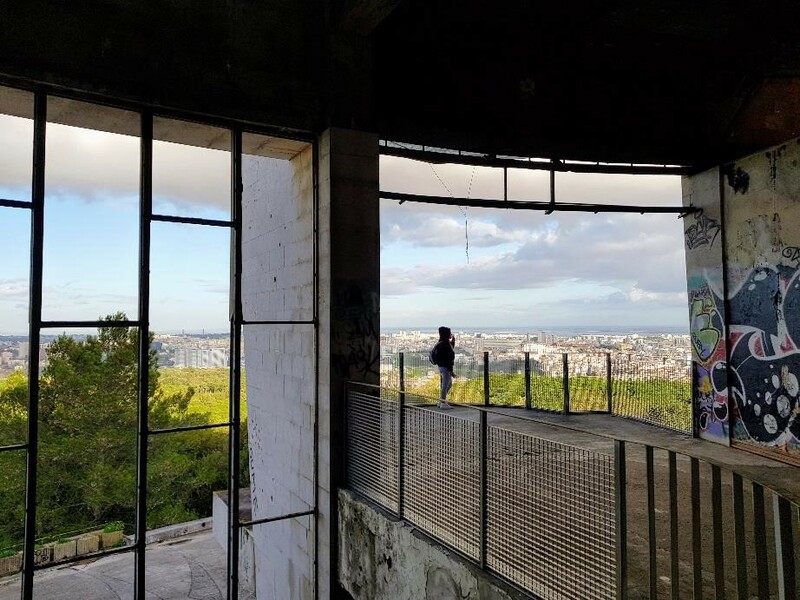 Go there now for the best view in Lisbon before everyone else finds out about it!